Well, it’s officially October! Where did the summer go? Weeks have gone by with little rain and fall mushrooms in our area of Virginia have been somewhat scarce lately. But something tells me that’s about to change! We’ve had several days of rain earlier this week and now a deluge is predicted for the weekend. Assuming we’re not all underwater next week, we can probably expect to see some fall mushrooms in our local environs soon. 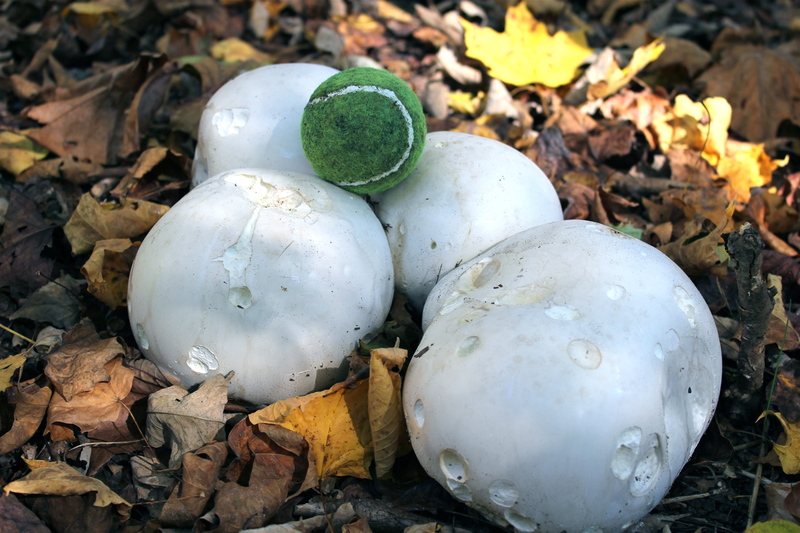 The giant puffball mushroom can be found in late summer and fall in fields and forests. While young, these round mushrooms are pure white– inside and out. When mature, the white insides turn greenish brown with developing spores (not very appetizing). Still later, the spores erupt like a fine dust when the mushroom is kicked or otherwise disturbed. It is a pretty impressive thing to see! I have read that giant puffball mushrooms are edible when they are young. Books say they should still be pure white inside when picked, and then they should be fully cooked before eating. I’ve tried it, but I’m not here to recommend it. It is sort of like eating flavorless marshmallows…a lot of work for no reward! See the gallery to have a look at the size of these things and to view a cooked slice of puffball–a “puffball cutlet” if you will. It definitely looks more promising than it tastes! Gracie with a giant puffball mushroom in August. Giant Puffball in October: Happy Halloween! I love all the pictures of family members with these giants. Nice tennis ball too.